Pumpkin carving, candy, witches, ghosts and gravestones make Halloween fun and spooky. At this same time, horror movies that put you in the special Halloween mood are also indispensible on this mysterious holiday. However, many frequently-recommended top Halloween movies for kids and families are not scary enough to get you into Halloween spirit. With a view to make sure you get the most boo for your buck, we've gather together 2016-2018 top 10 Halloween horror movies in horror genre that are critically acclaimed among movie goers, including the best animated movies for kids & families, and also top Hollywood movies for horror nights. Besides, simple guide on rip best Halloween new movies on DVD and also how to free download Halloween dracula movies 2016-2018. Hope you would enjoy watching the best Halloween-themed movies without giving you nightmares. MacX DVD Ripper Pro allows you to rip the latest and best horror movies for Halloween on Mac (macOS Mojave) and Windows (10) to iPhone Xs/Max/XR, iPad Mini 4/3, iPad Pro/Air 2, Samsung Galaxy S9 edge+, iPod, AVI, MP4 ,FLV etc, in addition, its copy feature lets you backup Halloween-themed movies DVDs onto your Mac/PC or USB with original 5.1 channels Dolby AC3/DTS audio. Any copy protections will be removed, including CSS, Macrovision content protection, region codes, Sony ARccOS, etc. With Halloween to some extent representing mystery, excitement and wonder, Miss Peregrine's Home For Peculiars is right the best Hollywood movie 2016 to watch on Halloween night. 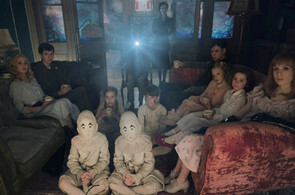 The movie, based on the young adult book by Ransom Riggs, is about a teenager who find a group of "peculiar kids" who have weird powers and protect them from the terrifying enemies with his special power. The movie has some wired elements, but it's not that scary for young audiences. Therefore, it's definitely one of top Halloween thriller movies for kids 2016 and worth a rental on Halloween night. You may free download the Halloween fear movie trailer 2016 before you get the DVD. Vampire movie is among the welcome horror movies for Halloween. The 2015 Halloween movie Hotel Transylvania 2 brought enough fun for 2015 horror nights and continues to be a Halloween treat for 2016. 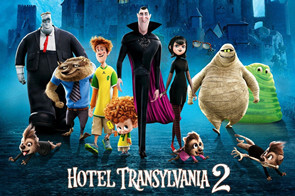 After the vampire Mavis and her human husband Johnny got married in the Hotel Transylvania, Dracula now worries about if his half-vampire, half-human grandson Dennis can be a good vampire. You may have bought the DVD movie and want to rip the animated movie to watch on mobiles with kids, or just get this Hollywood horror nights movie free download. When it comes to best Halloween movies for kids and families, it should be one that a little scary, funny and sweet. 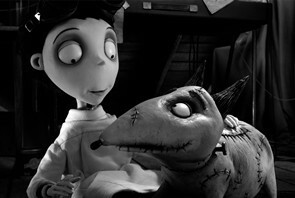 Frankenstein is among the top rated horror puppet movies. In this movie, the young Victor Frankenstein is an exceptional student who loves science. He has no friend but his dog Sparky. After Sparky died in a car accident, Victor brought his best friend back to life via an experiment inspired by his science teacher. That's not the whole story... The movie is a little bit dark and as the central theme is death, it's not suitable for kids at young ages. ParaNorman is a monster animated movie for a Halloween night. It's about an unordinary boy who can see and talk to ghosts has to stop a centuries-old witch's curse on their town. The movie is full of ghosts, copses, zombies, witches, creep houses and much more, all perfectly suitable for Halloween. As one of the top 10 Halloween movies, older kids who enjoy a good fright, and even adults audience will like it. Surely, this thriller movie is worth a shot on Halloween and you can free download horror movie trailer before you rent or buy this horror movie DVD. 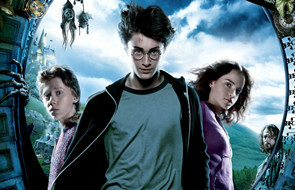 Harry Potter series is one of the most successful movie sagas ever. Worshipped by kids, enjoyed by adults, this modern myth has become an accepted classic worldwide. Pull any copy of the series off a shelf anywhere in the world and you're holding magic. Harry Potter is not among the top scary movies on Halloween, but the amazing magical world makes it one of the best Halloween fantasy movies for kids & families. I bet many fans have got the DVDs and no it's a good time to rip these top Halloween movies to enjoy them again on Halloween 2016. MacX Video Converter Pro is an all-in-one video downloader and converter that enables you to free download top 10 Halloween movies from YouTube and 300 other legal sites, as well as 2016 latest horror movies coming this Halloween in 4K, UHD 1080p/720p, 3D, 360 virtual reality movies etc and convert them to H.264/H.265 or MP4 that your iPad, iPhone or iPod could play with high quality. For those who want a scary Halloween night, the 2016 new horror movie The Conjuring 2 is not to be missed. The Conjuring 2 is the sequel to 2013's hit dracula movie The Conjuring, but it may overtake the first movie as the most scary horror franchise. The movie is said to be based on the true story of the Enfield Poltergeist. As a movie focusing its efforts on scaring the audience, it turns out to be a big success. Besides, you can rely on the recommendations of top DVD ripper to deal with these commercial DVDs without any error. To be released in horror fest film festival, 31 is set to be one of the top 10 Halloween movies. It tells about five carnival workers are kidnapped the night before Halloween and forced to play a twisted game. They have to survive the next 12 hours and hunted by a gang of homicidal maniacs. The movie is directed by Rob Zombie, who is good at making really scary movies. Now you can free download the Halloween horror movie 2016 to have a sneak peek. The 2016 horror movie is actually taking about mental illness instead of ghosts, but it creates some spiffy hair-raising scenes in the dark. Many audiences who have watched it considers it as the most visually and mentally scary films in the last two years and some are too frightened to stay at home alone at night or sleep alone without light. Before you buy or rent the movie DVD for Halloween, you're suggested to watch the trailer in case you can't finish watching. If you want a thrilling mood, the movie Don't Breathe will scare you into numbness. In the movie, three teenager thieves learn of a blind old man, who received a major cash settlement following the death of his only child, and break into the creep house and only to find they are trapped in. For many times they, as well as the audiences, hope there is a way out. If you want to see a real horror movie on Halloween night, just go for it. Released on October 21, 2016, the movie Ouija: Origin of Evil is right one of the best Halloween movies for 2016. 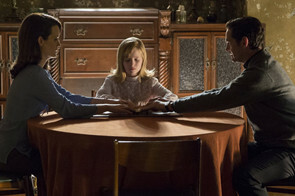 The movie is the sequel to 2014 horror film Ouija, about a game of Ouija in the same house of the first movie that accidentally invites authentic evil into the house. The movie has lots of scary imageries and jump scares. This movie is entirely fresh start for the franchise and you can download horror movie for 2016 Halloween.